I was hoping to get out to the newly renovated Salvador Dali Museum, but it's just too far away to actually get away. I've heard the new building is gorgeous, so eventually, I'll have to come back for it. 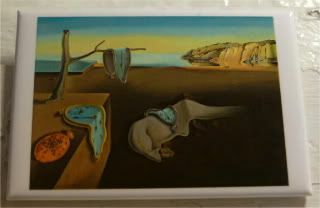 Even when I already have this Dali magnet of Persistence of Time. I do love Dali's concepts of time melting away - it's fitting, since we got so busy this week that I actually skipped a magnet two days ago and am now making up for it today. It also works because man, Tampa's hot, sometimes I feel like it's not just time melting, it's me, too! I can't believe my week here in Tampa is almost over.